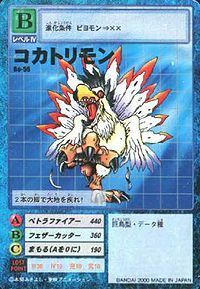 A Giant Bird Digimon with two overdeveloped legs. Because it has continued to live on the ground for so long, it cannot fly through the air, and has evolved a body that is suited for land. For that reason, its body became even larger, and its leg strength has developed tremendously, as well. Parts of its wings have completely degenerated, and in battle, it spreads them wide with its tail to intimidate the opponent. Its disposition is violently ferocious, but in order to preserve its large build, it dislikes violent battles that consume its energy. Its Special Move is "Petra Fire". It is a terrifying technique that does not carbonize those who suffer the technique, but completely petrifies their body. — Digimon Adventure: "Cockatrimon, the Illusionary Ship's Captain!" n., From Cockatrice (「コカトリス」 Kokatorisu), which is a mythical monster that was part snake and part chicken that possessed the ability to turn things to stone with its gaze. | Kokatori is a romanization of 「コカトリ」. Petra Fire  ペトラファイアー Petora Faiā Petra Fire/Frozen Fire Shot/Stun Flame Shot Unleashes a power from its eyes that petrifies whatever it looks at. Beak Slide  ビークスライド Bīku Suraido Sliding Beak Slices at the foe with its beak. Again Star  アゲインスター Agein Sutā Gangster Shoots blades of wind from its wings. Feather Cutter  フェザーカッター Fezā Kattā Feather Sword Throws the crest on its head like a boomerang at the foe. In "Cockatrimon, the Illusionary Ship's Captain! ", a Cockatrimon appears as a servant of Etemon and as the captain of a ship sailing the desert. After the Chosen Children and their partners have boarded the ship, he starts a suprise attack and petrifies the Digimon. Afterwards, Cockatrimon takes the Tags of the Chosen Children and lets the children roast in the sun. However, he misses Sora, Piyomon, Mimi and Palmon, as the girls were in the bathroom during his attack. 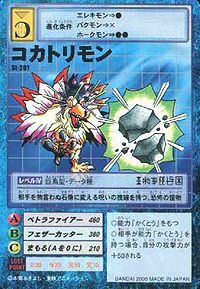 When Coacktrimon encounters them, the Digimon evolve to Birdramon and Togemon and defeat him, causing the effect of his Petra Fire attack to be undone. After the other children are freed, they all leave the ship, but then Cockatrimon, who survived, chases them with the ship. However, it collides with a giant cactus, causing the vehicle to be catapulted into the air and explode. Cockatrimon dies due to the explosion. Appears as the first enemy Digimon in the first episode of Digimon Savers. A Cockatrimon attacks a fast food restaurant, for which Agumon is initially blamed. Masaru and Agumon fight it, Agumon evolving to Geo Greymon when Masaru first gains his Digivice iC from an old fisherman, Yushima Hiroshi. 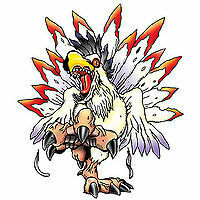 A Cockatrimon is one of the Digimon hunted by Tobari Ren. 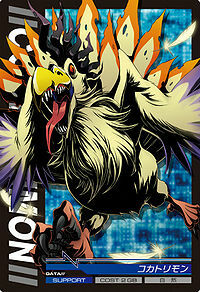 Cockatrimon appears as an obtainable Adult-level Vaccine type Digimon in Digimon World. After the Player has cleared Tonosama Gekomon and Jyureimon's quests, Jyureimon will dissipate the fog of the Misty Trees. At the east of the forest the Player will find several statues of Digimon that have been presumably petrified by a Cockatrimon. If the Player comes back to the screen at early morning, the Player will find a Cockatrimon which will engage the Player in a battle. After it is defeated, it joins the Village of Beginnings where it will build a statue of the Player in front of the Village's toilet, and another statue of the Player in the fountain of the main square. Bonus Conditions: Have Piyomon as a Partner and have at least 28 different techniques mastered. 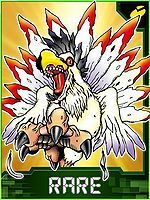 Cockatrimon's Digivolution item is the Rooster which lets any Child Digimon evolve into Cockatrimon. 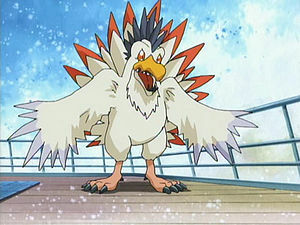 Hououmon (Cockatrimon can evolve into Hououmon naturally, but also via Death Evolution, which can be triggered by losing a battle, though this has a 50% chance of happening so its reccomended to save before trying it). Cockatrimon's eyes flash, then it releases an array of a mysterious air that petrifies the enemy. Cockatrimon evolves from Floramon (3-5 DP) and evolves into Delumon (0-5 DP) or Piccolomon (6+ DP). Cockatrimon is an obtainable Green Card. Can be evolved from Penmon if above level 27, or can be found at Mangrove Forest. Can evolve to Piccolomon or Parrotmon. 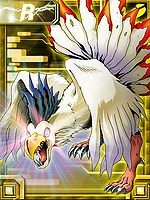 Cockatrimon is available as a Digimon Medal. 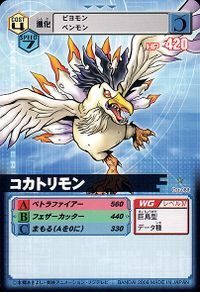 Cockatrimon is available as a Digimon Card. Evolves from Piyomon. Can evolve to Piccolomon. Cockatrimon is an enemy Digimon in Area 03 and 04. 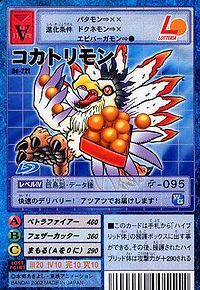 Cockatrimon is an enemy Digimon. This fearsome monster turns enemies into silent stone statues with its cursed gaze. It runs across the earth with its two feet! High speed delivery! We deliver it piping hot! 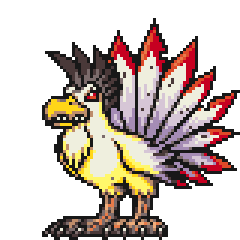 A Giant Bird Digimon that lost its ability to fly due to the prolonged time it spent living on land. 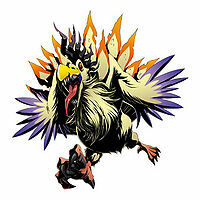 It uses its developed legs and body as weapons as it goes on a fierce rampage; however, its body is unable to convert energy very efficiently. ↑ Digimon Adventure V-Tamer 01: "Battle on the Tree"
This page was last modified on 22 March 2019, at 16:33.